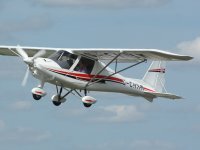 This full one hour lesson could be a one off or could be the start of a whole new experience - learning to fly. This lesson will give you chance to fly a modern microlight and to experience the thrill of handling the contols with the comfort of an instructor by you side. After a warm welcome from your instructor and a short safety briefing during which you can discuss where you would like to fly, you will walk out to the apron and get into the aircraft. Like all high wing aircraft the C42 is pretty much like getting into a car. Once safely strapped in you will be able to listen to the tower giving you clearance to taxi and then take to the skies. Once airborne your instructor will demonstrate the controls and then you will get chance to take the controls and fly the aircraft yourself. Soar above the north east with fantastic aerial views of Durham and other major landmarks like the Angel of the North and the beautiful coastline from Tynemouth to Middlesborough. Friends and family can wait for you in our pilot's lounge which has great views of the runway and apron. Free wifi and refreshments also available. This time can be logged in your logbook and will count towards the hours needed for your Pilot's Licence (NPPL) should you wish to continue your training.. Event takes place at Durham TV in Durham .